Multichoice Questions are a great way to quickly test students' understanding of topics. They are automatically marked with instant feedback. This article is for creating Multichoice Questions using the Advanced Editor and is intended for use by teachers who have received training from Education Perfect. It is possible to create questions that will not function using this version of the editor. If you're unsure, please refer to this guide. Multichoice Questions can be used in the Quiz sections of a Smart Lesson. Including them in other section types, such as Extended Response sections may result in compatibility issues. Once in the Content Library, ensure that you're on in Edit mode by clicking on the Edit button at the top right of the page. Begin with an existing Quiz section, or create a new one. Then select Advanced Editor. 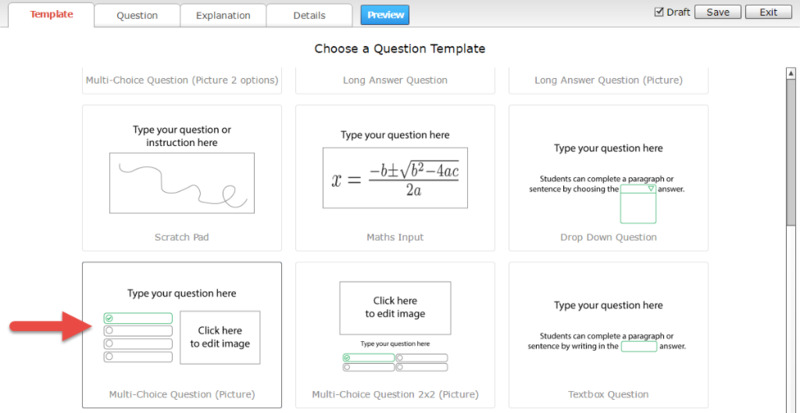 From here, select the 'Multichoice Question (Picture)' Template. Select the question text box, and select Edit. Type your question into the text-box that pops. Once satisfied, select OK. Select the Multichoice Component, and select Edit. In the Multichoice Component Editor, double click the Output Text Boxes, and type in your answers. 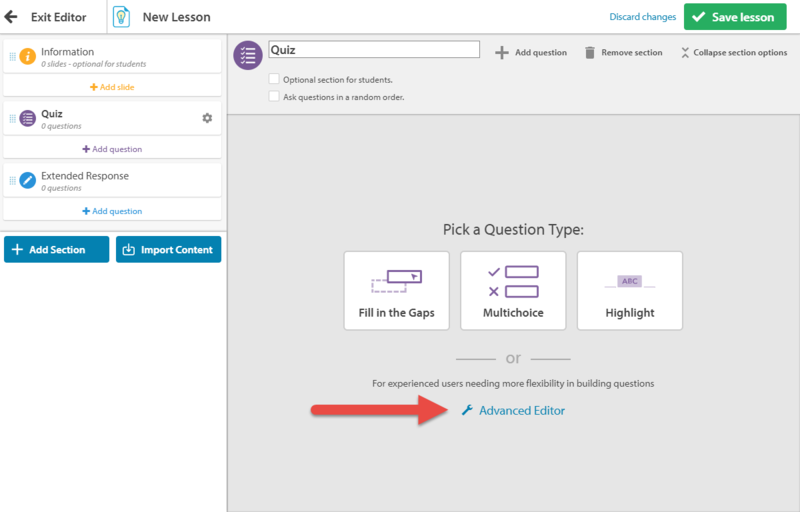 Select Add Option to insert additional answers. By default, the first box is the correct answer and the remaining options are incorrect. You can change this by selecting the Correct text box, and typing in "true" or "false" as appropriate. At least one answer must be correct, but a question can also have multiple correct answers. You can change how many answers are to be displayed (and how many correct ones, if multiple selection is checked) in the question by changing the number in the "Displayed Options" box. Once satisfied, select OK and the answers section will be added to the slide. If students incorrectly answer the question, they will be shown the correct answer automatically. 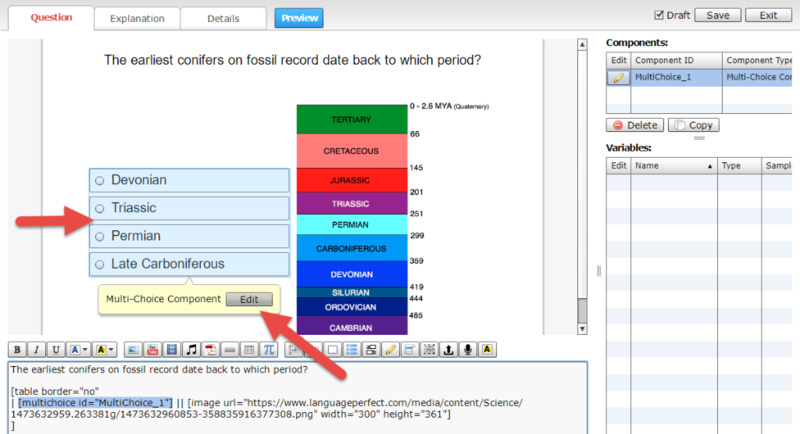 You can provide additional information about the correct answer by writing something in the Explanation tab. 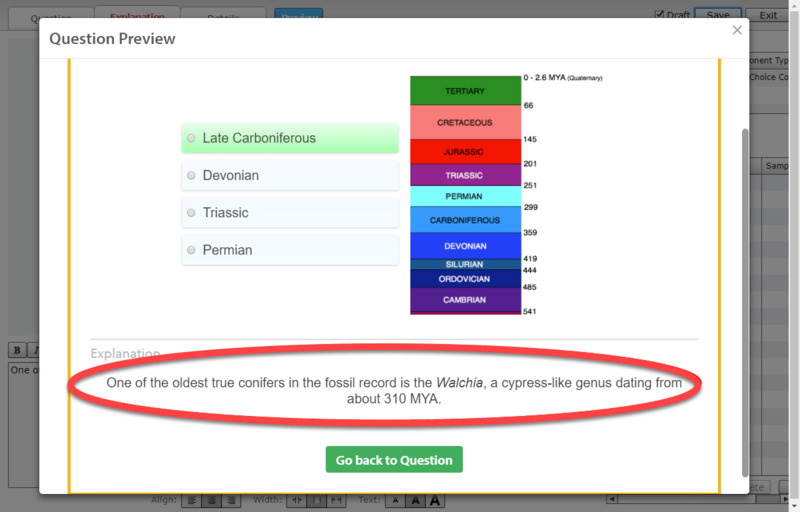 Anything that you write in the textbox at the bottom of the page will be displayed to students once they complete a question, along with the correct answers. 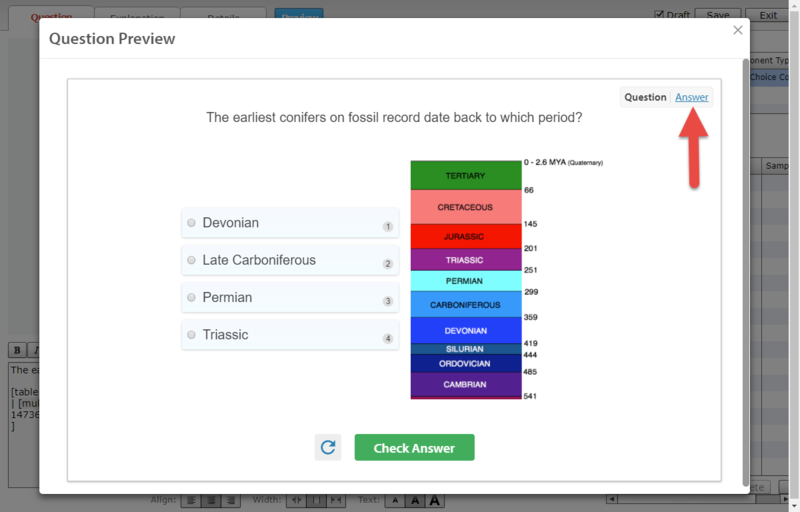 By default, answers will be shown to students in a randomised order each time. You can modify this through the Multichoice Component Editor. As before, select the Answers section of the slide and the Edit button that pops up. The Sort Order column on the right hand side is where you can format this; the answers will be ordered from the lowest number to the highest. Options with the same numbers will be ordered randomly in their allotted position. To see what your slide will look on the students' end, select Preview at the top of the editing screen. The Question Preview will pop up. Select the Answer tab to view a depiction of the secondary answer screen that will be shown once the question is answered. When you're happy with your question, give the question a name by navigating to the Details tab. Select the Title text box, and type in the name of your question. Select Save once you have finished making changes.